It’s been almost 3 weeks since Dragons of Tarkir was released, and while it was received somewhat lukewarmly at first, I think many players are beginning to warm up to it. 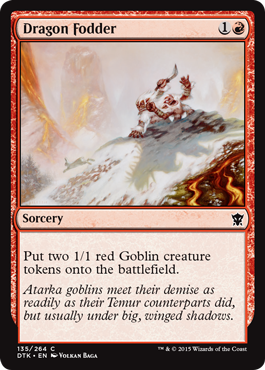 Cards that were “possibilities” such as Myth Realized have found homes in standard and Legacy, Dragons such as Dragonlord Atarka and Dragonlord Ojutai are seeing play, and even decks previously left for dead have had new life breathed into them (I’m looking at you mono red aggro with a splash of green for Atarka’s Command). Pro Tour Dragon’s of Tarkir is this weekend, and with hundreds of the best minds in Magic working together, you can be sure we’ll just how deep this set can go. The biggest tournaments so far with the new standard cards were done by Star City Games in last weekend and the week before, and while week one had a pretty diverse top 8, GR and R/g decks put a lot of similar builds in the top 20 of the Syracuse Open. Japan’s metagame was a little big different. In the first week of Dragons of Tarkir, GR aggro, GR Ramp, and GW aggro were already a thing. Players were taking down events with Dragonlord Atarka, Surrak, the Hunt Caller, and Thunderbreak Regent. Mastery of the Unseen seems to have sneaked its way into many decks either as a main deck or sideboard card, and Dromoka’s Command is also commonplace now in every GW/x deck. After the first week of GR and GW’s dominance here in Nagoya, many players moved over to Jeskai tempo and Abzan aggro strategies. Last week marked the start of the 2nd PPTQ season this year, and gave me a look at what to expect from this region’s players over the next few weeks. Before I get into that though, I’ll show you what changes I’ve made to my Mardu Tokens deck. The biggest changes I made to the deck for DTK Standard was adding Dragon Fodder and dropping Hordeling Outburst. While Outburst gave me more bodies, it made the deck slower and harder to put pressure on an opponent early in the game. Fodder gives me another 2 drop, and with 4 Lightning Strike main now, I shouldn’t have a problem to slow down or even stop those aggro decks early. A more recent adjustment has been to drop Stormbreath Dragon/Kolaghan from the mainboard in favor of Bile Blight. The reason being is that Bile Blight handles a lot of the aggressive decks well. It takes out mana creatures, Goblin tokens, and much more. I also have moved Outpost Siege to the mainboard, which has given me a lot of card advantage against decks like Abzan or other slow midrange strategies where the person with the most cards wins. It’s been a great asset to me this past week, giving me the gas I need to get the job done. The sideboard has also changed in response to a more heavy aggro/GW-centric metagame here. While my boardwipes are the same, I’ve decided to add in Wingmate Roc for aggro match ups as extra life gain, Sarkhan for Control match ups, Murderous Cut is much better in midrange battles now that most of my cards cost 2, and I believe that Self-Inflicted Wound is great against GW and Abzan aggro that use Fleecemane Lion and Rakshasa Deathdealer. It also isn’t bad against UW heroic that gives their creature protection from everything. I originally had Thoughtseize and Elspeth, Sun’s Champion in the sideboard as well, but with control currently seeing little play, I’ve decided to add in more removal instead. Cards like Glare of Heresy, while great against decks playing Narset or Elspeth, are also good against white based aggro decks such as UW Heroic, Abzan aggro, and Jeskai tokens/tempo. I’m currently trying out Kolaghan’s Command against control and a few other match ups, but that could be dropped in the future. Mardu Tokens has been doing pretty well for itself. I’ve beaten GW Manifest, GW aggro, GR aggro, BR Dash, Naya Midrange, Jeskai Tempo, Abzan Midrange, mono white soldier Obelisk, Jeskai Control, Temur Ascendancy Combo, and Temur aggro but I’ve lost to mono red aggro, GR Ramp, GB Dredge, UR Counter/Burn. A lot of the losses came down to not having the removal when I needed it, but counter/burn was especially difficult since they could counter almost anything I played. Overall the deck has been doing well against aggro and midrange decks that don’t have any evasion since I can block creatures on the ground all day long with tokens. My biggest problem has been hyper aggressive decks like mono red, as well as cards like Thunderbreak Dragon and Stormbreath Dragon. I did win a 29 person standard tournament with it back at the end of March though! My first big test with it came last weekend at a 33 person PPTQ in Nagoya. I lost against a UR tokens deck thanks to mulligans and mana flood in round 1 of this tournament, but then I rattled off 4 straight wins against Jeskai Tempo (2-0), Abzan Aggro (2-0), UW Heroic (2-1), and RW aggro (2-0). Going to 4 Lightning Strike greatly improved my match up against aggressive decks, and Sorin, Solemn Visitor was an absolute all-star on boards full of tokens. My sideboard performed greatly in these match ups and I drew all my removal when I needed it. I ended up drawing in round 6 and made the top 8. However, I still can’t seem to break my Top 8 curse at PPTQs. While this was my 5th Top 8 at a PPTQ with Mardu tokens, I have yet to make it past the first stage. I lost to Abzan in 3 games thanks to poor draws and mana flood. The Top 8 was: Mardu Tokens (me), Abzan aggro x4, GR Atarka Ramp, UR tokens, and Mono Red aggro. In the semi-finals Abzan aggro matched up against GR Atarka ramp and the other Abzan deck faced UR Tokens. When the dust cleared, Goto Yuusei (2nd place at GP Kobe in 2014) and his Atarka Ramp deck won it all. This is almost the same deck that many players at the Pro Tour have been using, and Yuusei has been putting up a lot of good finishes with it. There were a lot of aggro decks in the first week of April, especially of the Abzan and GR variety. On Sunday there was a much bigger 56 player PPTQ at Big Magic in Nagoya and with it an incredibly different metagame. Coming off a top 8 I was feeling pretty good, but the competition was tough and I ended up 2-4. I lost to Abzan aggro (1-2) in round 1 (couldn’t draw my removal when I needed it) but beat it in round 2 (2-0). After that it was all downhill. I lost to a Mardu Warrior/tokens (0-2) thanks to a mulligan to 4 in game 1, a RW Aggro (0-2) due to a big sideboarding error, and mono Red/splash green aggro when I couldn’t deal with Atarka’s Command. My only other win was against an Anafenza white weenie deck with a splash of green (2-0). I chalk up the poor results to mistakes and mulligans. The top 8 of this large PPTQ was Abzan aggro x2, Jeskai Tokens, Mono Red, GR Ramp, Jund Whip, GW Manifest, and Abzan Midrange. The winner of the event was Jeskai tokens. It had overwhelming card advantage was able to draw its way out of bad situations and kill opponents with Jeskai Ascendancy. Fast forward a week and the metagame has once again changed here in Nagoya. Abzan has been thrown to the side and most players are now using Jeskai Tempo or Jeskai Token strategies, but GR decks have also held steady. I’ve also seen a steady increase in Esper/UW control strategies as well. Black decks seemed to have disappeared from the metagame overall in favor of fast aggro ones. I managed to win a 23 person FNM on the 10th by beating Esper Control (2-1), Temur Aggro (2-0), and UW heroic (2-1). The battles were all epic. Each player put up an incredible fight but my tokens were able to put just enough pressure on each of my opponents while my burn and other removal came through when I needed it. My Saturday didn’t go to well though. I went 1-2 drop at a 14 person Grand Prix Trial for Chiba (more on why it had such a low number in my next article) after losing to Jeskai Aggro, beating GR Atarka Ramp, and losing to 5 Color Dragon Tempest. After the third round I went to Hobby Station over by Nagoya station and took part in a packed house of 37 people over there. The room was full of Jeskai Tempo/Tokens players as well as GR ramp and aggro. I beat Jeskai Tokens in round one (2-1), but lost to Jeskai Dragon Tokens in round 2 that was using Descent of Dragons + Battlefield Thaumaturge (1-2). That was not a fun game. I then lost two more in a row after that against Jeskai Aggro and GR aggro thanks to bad draws, but I managed to finish 2-3 by beating 4 Color Super Friends (2-1) using 18 Planeswalkers in the last round. Interestingly enough, Esper Control won it all which has me thinking that the archetype is on the verge of returning to the metagame. We just might see more control decks after the Pro Tour this weekend. After more than 2 months of using Mardu tokens, I’m ready for a change. While I think it has great removal and powerful creatures, I want to do something different for a while. You might have seen the GR Bees list going around at the Pro Tour, but while that deck is using the tokens to help activate Chord of Calling to search for a variety of threats, I have a slightly different idea of my own. 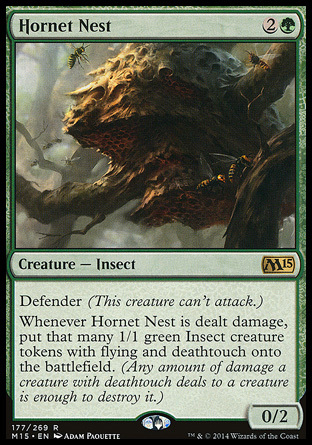 Whereas the GR Bees deck in the pro tour uses Chord of Calling to grab threats, I try to be a little more direct without leaving myself open to board wipes. I am playing Purphoros in the main board and using the combination of Outpost Siege and Chandra to dig to my win conditions. This gives me value no matter what instead of just grabbing one creature and being done with it. I was using Crater’s Claw and Stoke the Flames in the mainboard previously, but after seeing the efficiency of Roast + Hornet’s Nest I’m sold. I’ve also added in a second win condition of Descent of Dragons. With the amount of mana I can with my mana creatures, I can play it as soon as turn 3 to turn my mana creatures into 4/4 flying threats, or I can play it later on in the game with a board full of bees and turn them into an army of Dragons. With Purphoros, I get double the effect of both creatures entering the battlefield. In the sideboard, I have Anger to deal with other token decks like Jeskai Tokens, Sarkhan for control, Arbor Colossus to deal with flyers like Silumgar’s Fate Reforged form, Shamanic Revelation to gain life and draw cards against decks where Outpost Siege isn’t good, Atarka’s Command when I need more removal (fighting bees! ), and Crater’s Claws for a big finish against decks that can stall the board like GW Manifest. While it hasn’t been tested yet, I think this deck will do well against the current aggro heavy metagame. It has stopping power, card advantage, and can play defense while while still being offensive thanks to Purphoros. Next week I’ll be traveling to Kyoto along with a few of my friends to check out the Grand Prix. The format is Legacy, and in case you didn’t hear, it reached its cap of 1890 players in 9 days. This was rather disappointing because many people had planned to attend the event, booking tickets and hotels month in advance only to have it filled up. It sounds like the number one reason for this problem was the location. There simply isn’t a large enough exhibition hall in the Kyoto area to hold more than 2000 people. I blame whomever scheduled the event. Legacy is quite a rare format in the Asian region, and the schedulers underestimated the pull it could have. Had it not been capped, I’m sure GP Kyoto could have pulled in close to 3000 players. GP Kyoto was the second Japanese Grand Prix in a row to be capped, and I think foreign travelers will be more cautious when coming to Japan in the future. I wouldn’t be surprised to see a drop off in attendance next year due to the poor management of GP scheduling and registrations this year. Even though I have a UR Delver legacy deck built, I won’t be participating in the main event. Instead, I’ll be showing up on Saturday to do some trading, hang out with friends, play in some side events, and get some cards altered. I’ll be staying with my friend Aroni (MTGZoo.com) and just having a good time next weekend. I’m thinking of doing the Super Sunday Series for standard, but I could also just play my Tempest Cube with friends I see there. We’ll see! I wish I could help with the Legacy metagame, but I simply don’t have the experience with it. If you’re going to be there, find me and say hello so I can give you one of my new business cards! That will do it for today’s article, but I’m currently working on a comprehensive article detailing the fallout and problems of GP Chiba. I hope to have it up either Sunday night or Monday, so if you’re starving for information about the situation, check back later and hopefully I can shed some light on the subject. Thanks for reading and see you next time! Jeskai and GR aggro are huge over here and they mostly use lightning strike and stoke the flames. He’s not good in a black/x meta but he dies a lot less than hordechief (which I tried as a four of before. The change is possible but mets dependent. Turn 3 brimaz has run away against a few opponents I’ve played. I also was playing kolaghan/Sarkhan up until about a week ago and while they were good finishers, I often found myself siding them out because I was losing to fast decks that had lots of tokens or 3 toughness creatures. Bile Blight can basically be switched for either of those cards depending on your metagame. both are great against control and midrange, but not against aggro.